DJPC has several committees working on issues of human rights in Latin America. Advocacy and Nonviolent Activism Commitee, CAMINOS/PROMESA Committee, IT Committee, Mustard Seed Committee, Salon Discussion Series Committee, Special Events Committee To get involved visit the “Act” page to join one or more of these committees! The Advocacy Committee addresses and monitors U.S. policy on issues of human rights and economic justice affecting the people of Latin America. Each year specific issues are prioritized, e.g. in 2013, human rights in Honduras and the proposed Trans Pacific Partnership trade agreement. The Advocacy Committee often collaborates with national organizations in order to garner resources and make a greater impact. The Advocacy Committee engages DJPC’s membership through action alerts, Congressional visits, etc. In order to be able to expand the scope of its activities, the Advocacy Committee would appreciate your participation. If you are interested in becoming involved, please contact us! 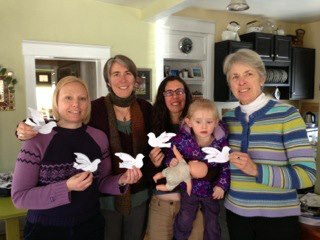 The Denver Justice and Peace Committee is dedicated to promoting human rights in Latin America through education, solidarity projects, and nonviolent activism. Expanding on these goals, DJPC has recently formed MineWatch, a group that responds to the issue of gold mining as a human rights concer n in Central and South America. 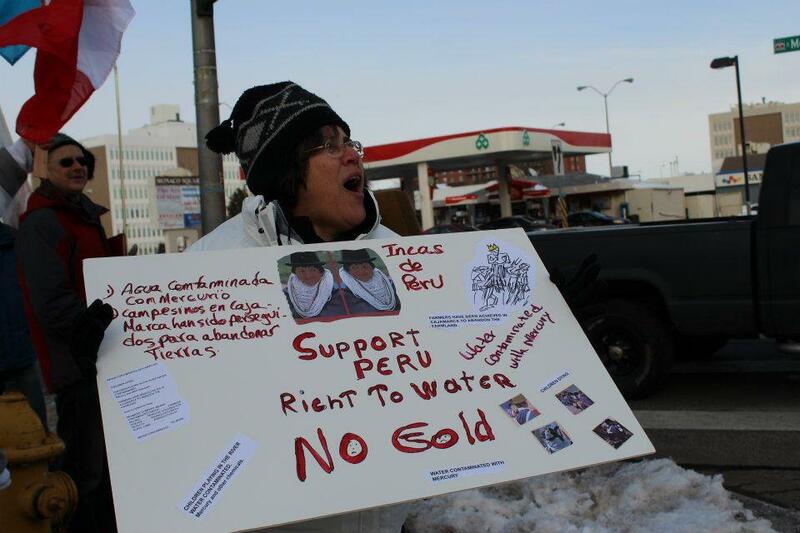 We at MineWatch are campaigning to hold Newmont Mining Corporation accountable to the people of Peru. 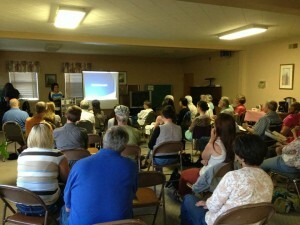 Our first step in creating transparency has been spreading community awareness. These outreach efforts have focused on providing presentations to organizations and schools in the Denver area to educate the community about the Peruvian struggle for human rights. Peruvians, specifically located in Celendin, are protesting for their right to water. They are also protesting against the construction of a new mine, Minera Conga, that would threaten the environment, human/animal health, and ultimately life in Peru. The IT Committee consist of volunteers with varying levels of experience in the computer and internet arena. Ideas are highly valued, so whether you are a computer person or not, your ideas could contribute a lot. Please consider joining us! 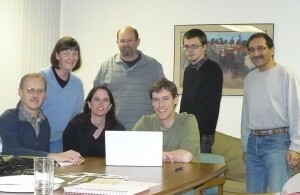 Current members include (see photo – left to right) Jerry Stookey, Patricia Davis, Bill Zimmerman, Hayden Gore, Jordan Schulz, Peter Taylor and, not shown, Tom DeJohn. DJPC features monthly informative, interactive, and stimulating discussions among people who are concerned about peace and justice in the world today. Our Salon Series Committee serves to explore future Salon topics, possible speakers, and documentaries. Through an exchange of ideas, the Committee seeks to improve Salon attendance, member participation, and generally contribute to DJPC’s informative and active efforts. The Committee thus far includes Rebeca Zúniga-Hamlin (DJPC Director of Program Services) and Connie Curtis (Chair of DJPC). We are currently seeking volunteers to join the Salon Series Committee, so please feel free to contact us if you are interested! Also, for information concerning our upcoming Salons visit our featured posts and calendar! The Special Events Committee has a wide variety of responsibilities, but the main are of focus is the annual awards ceremony, The DJPC Global Justice & Peace Awards Night. 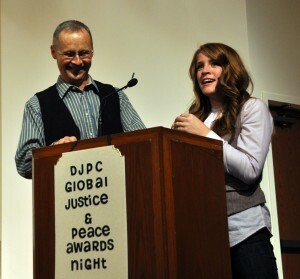 This event is held in November and is a great time for DJPC to honor people who truly make a difference in the world through their peaceful and just actions. All ideas, experience, and input is appreciated, and this committee does an incredible job planning this very important night. We would love more volunteers and hope you will contact us to get involved!